FOXBORO, Mass. — Ahh, the joys of being part of an NFL locker room. It sounds like Patriots quarterback Tom Brady barely got a foot in the door Tuesday before his teammates began ragging him for his Earth Hour public service announcement. Pats center Dan Koppen met with the media at Gillette Stadium on Thursday morning, and he was asked if Brady caught any lighthearted flack for showing up a week after the majority of the team reported for voluntary workouts. So, was it the long hair or the fruit bowl that garnered the most jokes? But don’t get it twisted, Koppen warned. 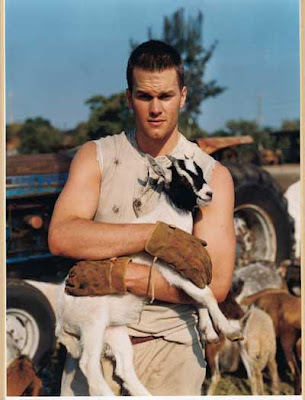 Nothing will top the picture of Brady cradling that goat. After those photos surfaced a few years ago, they were plastered all over the locker room at Gillette, and the team couldn’t even talk about it without bursting into laughter. It’s good to be back, isn’t it?